Finance Minister Yoshihiko Noda was chosen leader of the ruling Democratic Party of Japan on Monday. That all but ensures his selection as Japan's next prime minister. Japan is about to get a new prime minster — the sixth in five years. As early as Tuesday, Finance Minister Yoshihiko Noda could formally get the job. He all but captured the post Monday when he won the leadership race of the ruling Democratic Party of Japan. The challenges he faces will be huge. They include helping Japan recover from last spring's devastating nuclear and natural disasters and winning over a skeptical public. That skepticism was on display Monday. In Tokyo's Shibuya shopping district this afternoon, several college students huddled around a cellphone to watch the election results. But after word that Noda had won a five-way race to lead the Democratic Party of Japan, they seemed disappointed. Not just with Noda — but the entire field. "I think we have to wait for someone with charisma," said Ryosuke Takagi, who studies law at Keio University in Tokyo. Indeed, Noda, 54, described himself as resembling an eel-like fish. Takashi Nakashima, who studies chemical engineering, had just finished shopping in Shibuya for his fall clothes. He wondered whether Noda or other political leaders could make a real difference. "We have issues like the tsunami recovery and a strong yen which affect our nation's power and our companies' strength," he said. "But the politicians have not shown any clear direction and vision on what they are going to do about these issues." For Japan, the stakes these days couldn't be much higher. Nearly six months after an earthquake and tsunami devastated the country's northeast coast, the government has yet to begin rebuilding in earnest. Radiation continues to leak from the crippled nuclear plant. And the revolving door of Japanese politics continues to spin. "The problem is there is no leadership, no consistency at the top to follow through," said Jeffrey Kingston, director of Asian studies at Temple University Japan. He says Japan suffers from a paralysis familiar to anyone who follows Washington politics. "The opposition's strategy is to tie up legislation, and political gridlock is a way of discrediting the government," Kingston said. "And the prime minister serves as the lightning rod for all that frustration." Noda has pledged to work with the opposition. And Kingston says he has expertise well-suited to the current crises. Japan is still struggling to pull out of two decades of economic stagnation. The yen is the strongest it's been in decades, which is hurting the competitiveness of exports. And Japan faces a public debt twice the size of its gross domestic product. "He is the finance minister. He's knowledgeable about the problems. So I think that markets will definitely welcome his election," Kingston said. A key part of Noda's platform is raising taxes to fund reconstruction from the tsunami, an idea opposed by many in Japan. Shinsuke Takahara stood outside a metro station reading the headlines about the election. A retired salaryman with the Sapporo beer company, Takahara did not like the result. "He has already made it clear he's going to raise taxes, and that won't improve our economy," said Takahara, adding that he thinks the government should sell bonds to pay for tsunami reconstruction. Shinobu Kumagai, a former librarian, says she doesn't expect much from the new government. She hoped the disasters in March would ignite leadership here, but she says that hasn't happened. "After the quake it became very clear that our politics is very weak and it has not grown up even 60 years after World War II," she said. 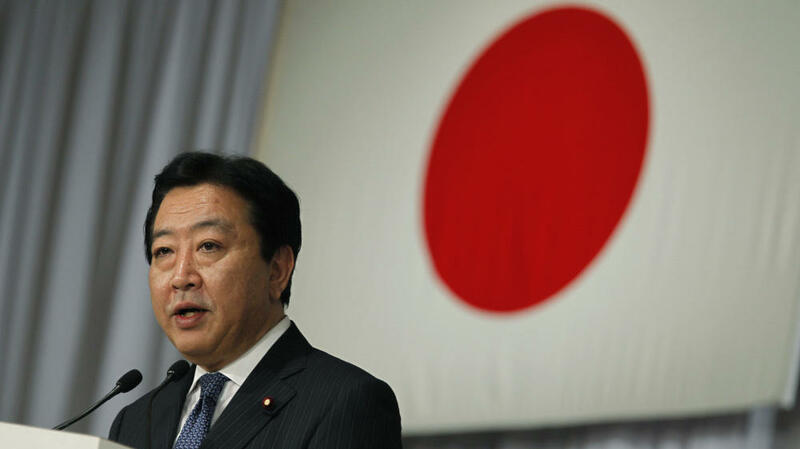 Noda will replace Prime Minister Naoto Kan, who was criticized for his handling of the March disasters. Kan spent less than 15 months in office. ROBERT SIEGEL, host: As early as tomorrow, Yoshihiko Noda will become Japan's new prime minister, the country's sixth in five years. Noda, the current finance minister, won a ruling party leadership race today and faces huge challenges ahead. Among them, helping Japan recover from last spring's devastating natural and nuclear disasters. As NPR's Frank Langfitt reports from Tokyo, Noda must also win over a skeptical public. FRANK LANGFITT: In Tokyo's Shibuya shopping district this afternoon, several college students huddled around a cellphone to watch the election results. But after word that Noda had won a five-way race to lead the Democratic Party of Japan, they seemed disappointed. Not just with Noda, but the entire field. Ryosuke Takagi studies law at Keio University in Tokyo. RYOSUKE TAKAGI: I think we have to wait for someone that has charisma. LANGFITT: Indeed, Noda, 54, described himself as resembling an eel-like fish. TAKASHI NAKASHIMA: (Through translator) We have issues like the tsunami recovery and a strong yen, which affect our nation's power and our companies' strength. But the politicians have not shown any clear direction or vision on what they are going to do about these issues. LANGFITT: For Japan, the stakes these days couldn't be much higher. Nearly six months after an earthquake and tsunami devastated the country's northeast coast, the government has yet to begin rebuilding in earnest. Radiation continues to leak from the crippled nuclear plant. And the revolving door of Japanese politics continues to spin. JEFFREY KINGSTON: The real problem is there's no consistency, no leadership at the top to follow through. LANGFITT: Jeffrey Kingston is director of Asian studies at Temple University Japan. He says Japan suffers from a paralysis familiar to anyone who follows Washington politics. KINGSTON: The opposition's strategy is to tie up legislation. And political gridlock is a way of discrediting the government. And the prime minister serves as the lightning rod for all that frustration. LANGFITT: Noda has pledged to work with the opposition and Kingston says he has expertise well suited to the current crises. Japan is still struggling to pull out of two decades of economic stagnation. The yen is the strongest it's been in decades, which is hurting the competitiveness of exports. And Japan faces a public debt twice the size of its gross domestic product. KINGSTON: He is the finance minister. He's knowledgeable about the problems. So I think that markets will definitely welcome his election. LANGFITT: A key part of Noda's platform is raising taxes to fund reconstruction from the tsunami. Many in Japanese opposed the idea. Shinsuke Takahara stood outside a metro station yesterday afternoon reading the headlines about the election. A retired salary man with the Sapporo beer company, Takahara did not like the result. SHINSUKE TAKAHARA: (Through translator) He has already made it clear he's going to raise taxes, and that won't improve our economy. It is said that Japan has lost two decades. And if taxes rise, the loss will continue. LANGFITT: Takahara says the government should sell bonds to pay for tsunami reconstruction. Shinobu Kumagai is a former librarian. She doesn't expect much from the new government. Kumagai hoped the disasters in March would ignite leadership here, but she says that hasn't happened. SHINOBU KUMAGAI: (Through translator) After the quake, it became very clear that our politics is very weak and it has not grown up even 60 years after World War II. LANGFITT: Noda will replace Prime Minister Naoto Kan, who was criticized for his handling of the March disasters. Kan spent less than 15 months in office. Frank Langfitt, NPR News, Tokyo. MELISSA BLOCK, host: You're listening to ALL THINGS CONSIDERED. Transcript provided by NPR, Copyright NPR.